In June, when the last list was released, the US had the most supercomputers with 169, followed by China with 160. On the new list, China counts 202, with the US in second place with 143. This represents the highest number ever for China and the lowest for the US. China also passed the US in aggregate performance, with 35.4 percent of the TOP500 flops. The puts the US in second place with 29.6 percent. Although supercomputers aren't on the public radar as much as conventional computers, they play an important role in areas such as quantum mechanics, national defense, weapon design, weather forecasting, oil and gas exploration, and climate research. Since being introduced in the 1960s, the US has dominated the field, until now. China already had the fastest supercomputer in the world, Sunway TaihuLight, developed by the country’s National Research Center of Parallel Computer Engineering and Technology. It remains number-one, weighing in with a High Performance Linpack (HPL) mark of 93.01 petaflops. In case you're wondering, a petaflop is a quadrillion floating-point operations per second. The second fastest system, which also belongs to the Chinese, doesn't even come close to the winner, running at 33.86 petaflops. That's Tianhe-2 (Milky Way-2), a system developed by China’s National University of Defense Technology. The largest system in the US is a five-year-old Cray XK7 system called Titan that ranks fifth at 17.59 petaflops. Titan is installed at the Department of Energy’s Oak Ridge National Laboratory and until July had been the third highest performing supercomputer on the planet. Six months ago Titan was knocked down a peg after the Swiss upgraded Piz Daint, a Cray XC50 system located in Lugano, Switzerland. On the new list it went down again, due to an upgrade of Gyoukou, a ZettaScaler-2.2 system deployed at Japan’s Agency for Marine-Earth Science and Technology which clocks at 19.14 petaflops and employs a record high 19,860,000 cores. China added another feather to its supercomputing cap with an announcement on Thursday that the Association for Computing Machinery (ACM), the world's largest scientific and educational computing society, has given a 12-member Chinese team the 2017 ACM Gordon Bell Prize. The prize has been awarded each year since 1987 to recognize outstanding achievement in high-performance computing applications and includes a cash reward that since 2011 has been set at $10,000. This year's prize winners were responsible for a project involving Sunway TaihuLight, in which they developed software that processed 18.9 Pflops of data to create 3D visualizations related to a major earthquake that occurred in Tangshan, China, in 1976. The team’s software included innovations that achieved greater efficiency than had been previously attained running similar programs on the Titan and TaihuLight supercomputers. With this week's Top500 list we also witness the last two supercomputers not running Linux (both were Chinese systems running IBM's AIX) dropping away to make Linux the only operating system being used on any top 500 system. Linux first entered the Top500 list in 1998, five years after the list began, and surpassed Unix as the most used OS in 2004. Now it's the last man standing. 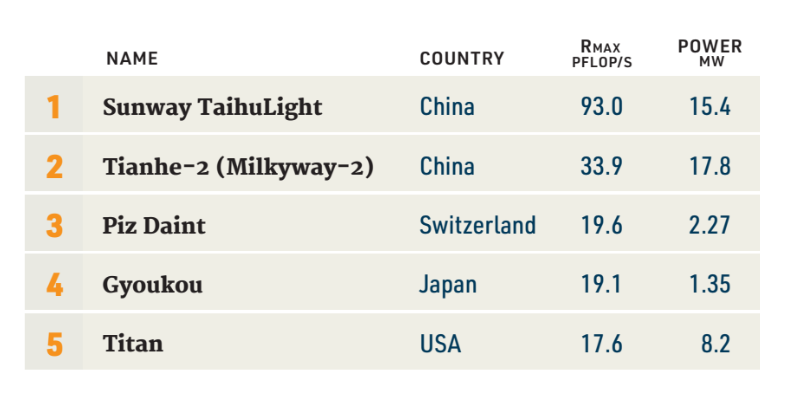 Of the 10 fastest supercomputers in the world, four are located in the US, three in Japan, two in China and one in Switzerland.